Company registration documents obtained by the Organized Crime and Corruption Reporting Project (OCCRP) and partners show that, since last spring, two former senior executives of Hungarian public television network Magyar Televízió (MTV) set up Macedonian companies that then made the investments in the country’s media. The companies acquired controlling stakes in firms that own more than half a dozen local outlets. The exact purpose of the acquisitions is unclear. The Macedonian outlets have a long history of support for the the former ruling conservative VMRO-DPMNE party, as well as causes favored by the populist right — including Hungary’s Fidesz — throughout Europe. They also have a history of spreading provocative and sometimes fabricated news stories targeting opposition and civil society groups. For Agnes Urban, a researcher from watchdog group Mertek Media Monitor, the purchases likely represent an effort by Orban’s government to expand its regional influence by backing its conservative populist allies. Orban’s public style “is built on continuous conflict with Western democracies and government communication following the style of Russian propaganda,” Urban said. These aren’t the first moves by pro-Orban media companies into the Balkans. Last March, three Hungarian media firms — one of which is now also involved in the Macedonian purchases — bought a 45 percent stake in NOVA24TV.si, a Slovenian outlet that serves as a mouthpiece for the country’s conservative Slovenian Democratic Party. The Hungarian companies have since upped their shareholding to nearly 88 percent. The Slovenia purchases also raised concerns that Orban’s loyalists are attempting to replicate abroad a model they pioneered at home, where his Fidesz government is backed by fiercely loyal state media and a plethora of outlets owned by allied businessmen that have targeted the government’s enemies. In a similar effort in Romania, the Hungarian government has funneled money towards media aimed at the country’s minority Hungarian speakers, many of whom hold dual citizenship. The purchases in Macedonia broaden this approach, giving pro-Orban outlets a foothold in a country far from Hungary’s borders. The Macedonia acquisitions were carried out by two Hungarian media executives, Peter Schatz, and Agnes Adamik. Though they built separate business structures in the country, there is evidence that the purchases were a joint effort. According to a senior Macedonian intelligence official, Schatz and Adamik traveled together to Skopje, the country’s capital, on several occasions in 2017 and 2018. And according to the corporate documents, they used the same Macedonian law firm to set up their companies. Schatz, a former head of business development at MTV, Hungary’s public broadcaster, is a co-owner and director of Ripost, a pro-Fidesz tabloid daily and news site that was one of the three pro-Orban companies to buy into to Slovenia’s NOVA24TV. Last year, Ripost also bought a majority stake in the publisher of two other Slovenian Democratic Party outlets, the political magazine Demokracija and the tabloid Škandal24. The Hungarian edition of Ripost, which is heavily funded by government advertising, specializes in salacious attacks on the government’s rivals, including hit-pieces accusing opposition figures of homosexuality. Two months later, the company acquired a 90 percent share in CHS Invest Group, a Macedonian holding company that ultimately controls Alfa TV, a television station closely aligned to the country’s former conservative VMRO-DPMNE government. The party, which ruled the country for a decade, lost power in 2017 amid investigations into corruption and abuses of power by senior officials, including former Prime Minister Nikola Gruevski, an Orban ally. Alfa TV’s website has since rebranded under the Ripost banner. 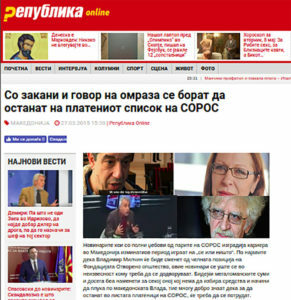 A separate Macedonian-language site, which solely uses the Ripost name, was created in the middle of 2017 and has been posting stories since at least as early as this February, according to snapshots recorded by the Internet Archive Wayback Machine. Domain records show that the site was by registered by Ripost’s branch in the Slovenian capital, Ljubljana. Schatz did not respond to questions sent via email. The second Hungarian, Adamik, also comes from Hungary’s public broadcaster, where she worked in top-level managerial roles for nearly three decades, including heading its digital operations. She left the organization in 2012. Macedonian business records show she set up her own local firm, called Adinamic Media, last September. Starting this April, the firm purchased majority stakes in three Macedonian companies which between them own seven websites and magazines that also have a history of vociferously backing Gruevski and his party. Adinamic’s first purchase, Prva Republika, publishes the news website Republika Online and until recently produced a weekly magazine. The company was originally set up in 2012 by Iresine Ltd, a mysterious firm registered in the Central American tax haven of Belize. Ownership was transferred in 2016 to Done Donevski, a Macedonian citizen whose identity has remained unknown for years, despite efforts by reporters to track him down. Adinamic gained control by buying 51 percent of Donevski’s stake. The second purchase, EM Media, publishes the online news sites Kurir, Lider, Denesen, Ekonomski, and Vistina. The company was previously controlled by Aco Misajlovski, the brother of a prominent VMRO-DPMNE member. The sites in EM Media’s stable typically run news with a conservative bent. They have also run stories attacking independent journalists — including OCCRP partners — as being “on the payroll” of billionaire Hungary-born philanthropist George Soros. These acquisitions were followed by the purchase on May 9 of an unspecified stake in LD Press Media, the company that runs the conservative news portal NetPress. Adamik declined to answer a reporter’s questions when reached by telephone. The Balkan business moves appear to be an effort to expand on the media model created in Hungary under Orban, who has embarked on a project of building an “illiberal democracy” in the heart of Europe. Since taking power in a 2010 landslide, Fidesz has asserted control over Hungary’s public broadcaster, which runs a steady stream of stories that praise the government and targets its declared enemies, such as Middle Eastern migrants and Soros. Arguably more significant, however, has been a buy-up of private media throughout the country by businessmen closely aligned to the party. Though these private media companies are nominally independent, “journalists who work for these outlets … tell us that they must follow pro-government editorial guidelines dictated by the outlets’ new owners,”, David Kostelancik, Chargé dʼAffaires at the United States Embassy in Budapest, said in an October 2017 speech. Private media with a pro-Fidesz line have benefited from massive advertising expenditures by the government. In just one example, OCCRP partner Atlatszo.hu found that the government spent more than €40 million in taxpayer money on media advertisements in a 2017 campaign targeting Soros. European observers of the country’s April elections cited government advertising purchases as one factor contributing to the country’s stifling media environment. According to Hungarian watchdog Mertek Media Monitor, Hungary’s pro-Fidesz media contains an “immediate circle” of outlets which, employees say, receive regular editorial direction from the government and its advisors. This key group includes Schatz’s Ripost, which was involved in both the Slovenian and Macedonian purchases. Reportedly overseeing much of Fidesz’s media apparatus has been Arpad Habony, a secretive unofficial advisor to Orban who is reported to wield heavy influence among the pro-Fidesz outlets, including those owned by his firm, Modern Media Group (MMG). MMG was one of the companies that, along with Ripost, bought into Slovenia’s NOVA24TV. Habony has been likened to Steve Bannon, the former head of right-wing US news site Breitbart. He was once a business partner of the late US political strategist Arthur Finkelstein, a man regarded as a pioneer of negative campaigning in US politics. This story was reported in collaboration with Investigative Reporting Lab Macedonia and Atlatszo.hu. Additional reporting by Anuska Delic.